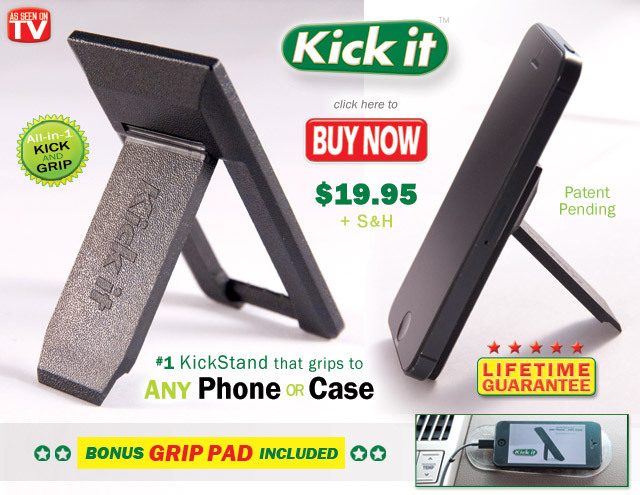 Kick it cell phone stand contact info, cell phone accessories wholesale and product inquiries about our cell phone holder and car mount. 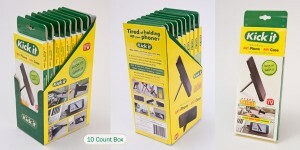 If you ordered a Kick it cell phone stand from a toll free number that was provided in a commercial that you saw on TV, or if you ordered directly from one of our product-devoted websites, please refer to your invoice or billing statement for the dedicated toll free number related to your purchase. If you cannot find that number, please fill out the form above. Please note that due to heavy telephone call volume at our customer service centers, it may be difficult to get through to our customer representatives and we appreciate your patience. However, should you wish to phone us and to avoid a long wait, it is suggested that you call on Thursday or Friday 10:00 AM to 5:00 PM Eastern Time. Your Satisfaction is 100% Guaranteed. If you are dissatisfied with any merchandise from Gadget Ear Technologies for any reason, simply return the product within 30 days for an easy refund of your purchase price, excluding shipping and handling. See our return policy for more information. Exceptions may apply. We welcome all inquiries about our product, but please keep in mind if it is not a business related matter that has to do with cell phone accessories wholesale purchasing, it may take a few days for us to answer and respond to your request. Please do not take it personal as we may be back logged with orders. Thank you for your support, patience and understanding. We truly hope you enjoy the Kick it cell phone stand for many years to come!